Measure for Measure is possibly the least astronomical of Shakespeare's plays. It is set in Vienna and it is very doubtful if Shakespeare ever visited Vienna himself. 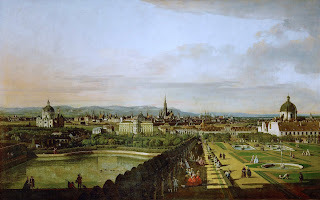 Shakespeare also used Vienna as the setting for the play within a play 'The Murder of Gonzago' in Hamlet. My guess is that if Shakespeare travelled to Italy and visited Venice he would have met Viennese merchants. The Vienna of Shakespeare's time is unlike the Vienna of today. Shakespeare's Vienna is filled with brothels, prisons and disreputable bars. Possibly Shakespeare had the South Bank area of London in mind but it would have been too problematic to set Measure for Measure in London in case any of the characters invited comparison with the rich and powerful governors and rulers of London. To get around this problem he set the play in Vienna and gave the characters Italian names. The Duke is called Vincentio. Having just returned from a short visit to Vienna I have to admit I did not meet anyone called Vincentio. However, the Duke's castle is still there and is nowadays called the Hofburg Palace. 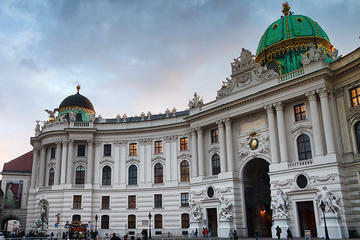 There is another famous palace in Vienna which is now the Belvedere Gallery. A view from the very impressive gardens was painted in by Bernadino Belloti in 1758 (the palace was not there in Shakespeare's time as its construction was only started in 1712). Here is a photo I look last week which shows that the gardens have remained largely unchanged but the Viennese skyline has grown upwards since the 18th century. The Belvedere is now a world famous art gallery with top quality exhibits especially Jungenstil art from Vienna's golden period by Klimt, Schiele, Kurzweil and Kokoschka. There are actually three galleries on the site https://www.belvedere.at/ and I could have happily spent all day there except I had a plane to catch and had to leave at midday. The two astronomical quotes that I could find in Measure for Measure are both spoken by Duke Vincentio. In Act III, Scene 1 he says "For thy complexion shifts to strange effects like the Moon". i.e. your moods change as often as the phases of the Moon. The Duke uses the ever changing lunar cycle to explain Claudio's shifting personality. I could imagine the actor playing the Duke in this scene on an open stage pointing to the Moon in the sky to illustrate his words. The second instance is in Act IV Scene 2 when Duke Vincentio says "the unfolding star calls upon the shepherd". The unfolding star is Venus, the morning star, which means that it is nearly dawn and the night is over. The Duke's use of astronomical phrases means that he is able to use few words to set a scene by drawing comparison to the night sky and also shows that he is an educated man. However, the genius of Shakespeare was that it is not necessary to be educated to enjoy and understand his plays. There is something for everyone to admire.